by Prof. Clifford James Geertz, PhD (1926-2006), made public between 2000 & 2009. (b) The 2001-2006 files have been copied illegally into http://www.visualanthropology.com.cn/Article/ShowArticle.asp?ArticleID=304; ( named there "Clifford Geertz III (2001-2006)" and copied here as proof (data status 05/2006, download 28/03/08). Available light: anthropological reflections on philosophical topics. Princeton/N.J./USA: Princeton University Press (XVII, 271 p.; contains 68Aeng1, 84Aeng1, 85Aeng2, 86Aeng1, 90Aeng1, 92Aeng1, 94Aeng3, 95Aeng3, 95Ieng1 (in the version of 98Aeng1), 97Aeng1 (as part of 00Aeng5), 97Aeng2, 98Aeng2, 99Beng1, 99Aeng1, 99Ieng4, 00Aeng1, 00Aeng2, 00Aeng5). complete electronic book version via NetLibrary. see also the WorldCat-entry (and also the following entry). paperback edition Princeton/N.J./USA 2001: Princeton University Press. translation into Polish: 03Tpol2 (all chapters), 03Tpol3 (chapt. 16 only). translation into Turkish: 07Ttur1 (selected chapters). Preface, = chapt. 1 in 00Beng1, pp. IX-XIV. full text excerpt in: http://www.pup.princeton.edu/chapters/s6780.html. translation into Italian in 01Tita1. translation into Portuguese in 01Tpor1. Culture, mind, brain: brain, mind, culture, (lecture at the inaugural symposium, Fernand de Saussure Foundation, Archamps/Genéve/SUI, 1999, see 99Ieng4) = text 15 (chapter X) in 00Beng1, pp. 203-217.
translation into Portuguese in 01Tpor2. Geiger at Antioch, in: The Antioch Review (Yellow-Springs/Oh./USA: Antioch Review Inc.), vol. 58 no. 1, p. 53 (= short version of the speech by Clifford Geertz at the Princeton Club in New York spring 2000 (sponsored by the Columbia University Alumni Association), to honor two distinguished members of the class of 1924 (Meyer Schapiro & George Geiger); long print version = 01Aeng4; see also the speech itself as 00Ieng9). (illegal copy: without quoting HyperGeertz(HTM) and EBSCO as directly used online source). Indonesia: starting over, in: The New York Review of Books (New-York/N.Y./USA: A. W. Ellsworth, etc. ), vol. 47 no. 10 (May 11, 2000), pp. ?. Bruner’s imbalancing act. Jerôme Bruner's cultural psychology, in: Bakhurst, David J./ Shanker, Stuart G. (eds. ): Language, culture, self: the philosophical psychology of Jerome Bruner. London/UK 2000 & Thousand Oaks/Ca./USA 2000: Sage Publications, pp. 19-30 (= enlarged version of 97Aeng1, prepublished as text 14 (= chapter IX) in 00Beng1). (New) Preface (to the 2000 re-edition), in: Local knowledge: further essays in interpretive anthropology, New-York/N.Y./USA 2000: Basic Books Classics, pp. ix-xi. (New) Preface (to the 2000 re-edition), in: The interpretation of cultures, New-York/N.Y./USA 2000: Basic Books Classics, pp. vi. Close encounters: ethnographic perspectives on global issues, a lecture by Clifford Geertz, at: Cable Co-op Channel 6 (San Francisco/Ca./USA), Jan. 16, 2000 at 6:30 & 10:30 p.m. and Jan. 17, 2000 at 1:30 p.m. (= broadcast of a "Lecture April 9, 1999, Stanford University/Ca./USA, Dept. of Cultural & Social Anthropology, celebrating the 50th anniversary of humanities and sciences", see 99Ieng3). video copy available via the KVIE 6 Cable-Channel-archive (written request and fees). Indonesia: reflections on a trip to a troubled land, lecture at: Seminar on Ethnicity and Nationalism, Weatherhead Center for International Affairs, Cambridge/Ma./USA, February 22, 2000 (audio recording available on request at the center). Interviews (with Neni Panourgia, Konstantinos Tsoukalas, Pavlos Kavouras), recorded (1) February 1999 in Princeton; (2) Summer 1999 in Hermoupolis/Syros/Greece), broadcasted 2000, Greek Independent Television, Program "Paths of Thought" (Athens/GRE; exact date ?). video available via the Athens Independent Television Company (no internet; Tel. 0030-210 68 86 384, on request). (illegal copies: without quoting HyperGeertz(HTM) and SagePub as directly used online sources). Clifford Geertz (Interview with Phillip Adams), broadcasted at: Late Night Live (Radio National Australia: The Australian Broadcasting Corporation's national radio network of ideas; Canberra/AUS), June 13, 2000, 10 h pm. audio recording available via the ABC-radio archive in Sydney (application and fees required). The future of religion, public lecture at: University of Konstanz/GER, as part of the opening of the "Konstanzer Meisterklasse 2000" (together with Dahrendorf, Ralf, and Luckmann, Thomas), September 12, 2000, 16.00 - 18.00 h, room V 1001 (documentation: private notices f.e. by Berhard Giesen, University of Konstanz/GER). audio recording available via the "Lehrstuhl für Makrosoziologie" der Uni Konstanz (application and fees required). Modern transformations of religion and morality, morning lecture at the "Konstanzer Meisterklasse 2000", University of Konstanz/GER, September 13, 2000, 10.00 - 12.00 h, Schloss Seeheim/Konstanz/GER (documentation: private notices f.e. by Mathias König/ Cornelia Richter, University of Marburg/GER). Religion and the public sphere, morning lecture at the "Konstanzer Meisterklasse 2000", University of Konstanz/GER, September 14, 2000, 10.00 - 12.00 h, Schloss Seeheim/Konstanz/GER (documentation: private notices f.e. by Mathias König/ Cornelia Richter, University of Marburg/GER). Thick description as method, morning lecture at the "Konstanzer Meisterklasse 2000", University of Konstanz/GER, September 18, 2000, 10.00 - 12.00 h, Schloss Seeheim/Konstanz/GER (documentation: private notices f.e. by Mathias König/ Cornelia Richter, University of Marburg/GER). printed in two versions: 00Aeng3 (short version) and 01Aeng4 (long version). Negara teater: kerajaan-kerajaan di Bali abad kesebilan belas. Yogyakarta/IND 2000: Yayasan Bentang Budaya (XIII, 564 p.; = translation of 80Beng1; trad./ diterjemahkan: Hadikusomo, Hartono). Niegara: el estado-teatro en el Bali del siglo XIX. Barcelona/SPA 2000: Paidós (coll. "Básica"; 285 p.; = translation of 80Beng1; trad./ traducción: Álvarez, Albert Roca). = "Después de la revolución: el destino del nacionalismo en los nuevos estados", part 1 (first published as chapter 9/1 in 87Tspa1, here published as slightely revised and reworked version according to the 1999 edition). Gli usi della diversità, in: Borofsky, Robert L. (ed. ): L'antropologia culturale oggi, Roma/ITA 2000: Meltemi, pp. 555ff. (= translation of 94Reng5; trad. : Livini, Umberto; = revised version from 94Tita). ristampa 2004 riveduta e corretta. Indonesia: si ricomincia, in: La Rivista dei Libri (Firenze/ITA: La Rivista dei Libri S.R.L. ), vol. 10 no. 10 (ottobre 2000), pp. 21-24 (= translation of 00Aeng4; trad./ traduttore: ?). Os usos da diversidade, in: Revista Horizontes Antropológicos (special issue: "Diversidade Cultural e Cidadania"; Porto-Alegre/R.S./BRA: Universidade Federal do Rio Grande do Sul (Campus do Vale), Instituto de Filosofia e Ciências Humanas; note: = "Programa de Pós-Graduação em Antropologia Social no. 10: Diversidade cultural e Cidadania"), pp. 13-34 (= translation of 86Aeng1; trad./ tradução: Ribeiro, Vera). (6) "Byc tu, pisac tam", pp. ?. (transcription of further Polish chapters not available). Zaswiadczajace ja: dzieci Malinowskiego, in: Konteksty: Polska Sztuka Ludowa. Antropologia kultury-etnografia-sztuka (Warszawa/POL: Instytut Sztuki Polskiej Akademii Nauk), vol. 54 no. 1-4 (= no. 248-251; 2000), pp. 108-121 (= partial translation (chapt. 3) of 88Beng1; trad./ tłum. : Dżurak, Ewa). Kultúrák, in: Magyar Lettre Internationale (Budapest/HUN: Jelenkor Kiadó), no. 38 (2000), pp. ? (= translation of ? ; trad./ fordítása: Karádi, Éva). (illegal copy: without quoting HyperGeertz(HTM) and C3.hu as directly used online sources). Osztályozó, naptárak és a pontos idő, in: Fejős, Zoltán (ed./szerk. ): Idő és antropológia. Fordítások gyűjteménye. Budapest/HUN 2000, Osiris, pp. 103-111 (= translation of ? ; trad./ fordítása: Fejős, Zoltán). Történelem és antropológia, in: Sebők, Marcell (ed./szerk. ): Történeti antropológia. Módszertani írások és esettanulmányok. Budapest/HUN 2000: Replika Kör, pp. 109-122 (Replika Könyvek 7; = translation of 90Aeng1 "History and anthropology"; trad./ fordítása: Kristóf, Ildikó). Na mieste činu, in: Slovensky národopis [Slovak Ethnology] (Bratislava/SLK: Slovenská Akadémie Vied), vol. 48 no. 1 (2000), pp. 93-103 (= partial translation ("Being there. An anthropoligist as a writer" = chapter 1) of 88Beng1; trad.: ? ). also available as electronic book: 地方性知识阐人类学论文集; Beijing 2000: Zhong yang bian yi chu ban she (Superstar Digital Library; see the Worldcat-entry). reprints (in Taiwan): 02Rchn1, 07Rchn1 (revised Taiwanese edition). The impact of the concept of culture on the concept of man, in: Levinson, Bradley A. U./ Borman, Kathryn M. et al. (eds. ): Schooling the symbolic animal: social and cultural dimensions of education. Lanham/Md./USA 2000: Rowman & Littlefield Publishers, pp. 25-30 (= reprint of 66Aeng2). Art as a cultural system, in: Whitlock, Keith D. (ed. ): The Renaissance in Europe: a reader. New-Haven/Ct./USA 2000: Yale University Press & London/UK 2000: The Open University, pp. ? (= reprint of 76Aeng1). I witnessing: Malinowski's children, in: Konteksty: Polska Sztuka Ludowa. Antropologia kultury-etnografia-sztuka (Warsaw/POL: Instytut Sztuki Polskiej Akademii Nauk), vol. 54 no. 1-4 (= no. 248-251; 2000), pp. 122-131 (= partial reprint (chapt. 3) of 88Beng1). Culture and human nature, in: Cahill, Spencer E. (ed. ): Inside social life: readings in sociological psychology and microsociology (Third edition). Los-Angeles/Ca./USA 2000: Roxbury, pp. ? (= excerpt: pp. 6-9, from 65Beng1). Deep play: notes on the Balinese cockfight, in: Crothers, Lane I./ Lockhart, Charles H. (eds): Culture and politics: a reader. New-York/N.Y./USA 2000: St. Martin's Press, pp. ? (= reprint of 72Aeng1). Agricultural involution: the process of ecological change in Indonesia. Berkeley/Ca./USA 2000: Publ. for the Association of Asian Studies by Univ. of California Press (= reprint of 63Beng1). Ideology as a cultural system, in: Boudon, Raymond/ Cherkaoui, Mohammed A. (eds. ): Central Currents in Social Theory. Contemporary Sociological Theory: 1920-2000, Volume Seven, London/UK etc. 2000: Sage Publications, pp. ? (part 4 continued: Social representations;= reprint of 64Aeng2). Clifford Geertz [Quotations on Religion and Culture], in: Sills, David Lawrence/ Merton, Robert King (eds. ): Social Science Quotations. Who said what, when, and where, Piscataway/N.J./USA 2000: Transaction Publishers, pp. 76-77. Presents a collection of quotations related to religion and culture by U.S. anthropologist Clifford Geertz (via EBSCO). übers./ translated into German: Cackett, Robin. La revolución integradora: sentimientos primordiales y política civil en los nuevos estados, in: Fernández Bravo, Alvaro (comp. ): La invención de la nación: lecturas de la identidad de Herder a Homi Bhabha, Buenos Aires/ARG: Manantial , pp. ? (= reprint of chapt. 10 in 87Tspa1 = translation of 63Aeng1; trad. : Bixio, Alberto Luis). Inboryushyon: uchi ni mukau hatten. インボリューション: 内に向かう発展, Tokyo/JAP 2001: 東京 - NTT 出版 (Enutitishyuppan = NTT S'yuppan; 287, XXVIII pp.) (= Japanese translation of "Agricultural Involution" (63Beng1) & of "Culture an Social Change: the Indonesian Case" (84Aeng2); translation: 池本幸生; Ikemoto, Yukio). Some details of the Japanese description: クリフォード・ギアーツ著; 池本幸生訳<インボリューション: ウチニ ムカウ ハッテン. Life among the Anthros, in: The New York Review of Books (New York/N.Y./USA: A. W. Ellsworth, etc. ), vol. 48 no. 2 (February 8, 2001), pp. 18-21 (= Book review on: Tierney, Patrick: "Darkness in El Dorado: how scientists and journalists devastated the Amazon", New-York/N.Y./USA 2000: W.W. Norton). full text: http://www.nybooks.com/articles/14054 (subscribers or charge). (illegal: without quoting HyperGeertz(HTM) as directly used online source). "Der Wissenschaftler Clifford Geertz setzt sich in seiner Besprechung von Patrick Tierneys 'Darkness in El Dorado: How Scientists and Journalists Devastated the Amazon' vor allem mit den schweren Vorwürfen auseinander, die Tierney für seine Kritik an den Ethnologen Napoleon Chagnon und Jim Neel einstecken musste. Zwar findet auch er das Buch streckenweise substanzlos oder schlicht unfair, doch wurde für ihn bei der Lektüre auch klar, dass etwas an der Arbeit von Chagnon und Neel, die jahrzehntelang die Yanomami erforscht haben, grundlegend falsch war: "The problem was that the anthros (and the médicos), reductionist to the core, conceived the object of their study not as a people but as a population. The Yanomami … were a control group in an inquiry centered elsewhere." Empowering Aristotle, in: Science (Cambridge/Ma./USA: Moses King), vol. 293 = no. 5527 (July 6, 2001), p. 53 (= Book review on: Flyvbjerg, Bent: "Making social science matter: why social inquiry fails and how it can succeed again", New-York/N.Y./USA etc. 2001: Cambridge University Press). (illegal copy: without quoting HyperGeertz(HTM) and Science as directly used online sources). The visit, in: The New York Review of Books (New York/N.Y./USA: A. W. Ellsworth, etc. ), vol. 48 no. 16 (October 18, 2001), pp. 27-30 (= Book review on: Hua, Cai: "A society without fathers or husbands: the Na of China", New-York/N.Y./USA 2001: Zone Books, distributed by the Massachusetts Institute of Technology Press). Geiger at Antioch, in: The Antioch Review (Yellow Springs/Oh./USA: Antioch Review Inc.), vol. 59 no. 2, pp. 505-511 (note: = full version of the "Speech by Clifford Geertz at the Princeton Club in New York spring 2000 (sponsored by the Columbia University Alumni Association), to honor two distinguished members of the class of 1924 (Meyer Schapiro & George Geiger)"; short version = 00Aeng3). (illegal copy: without quoting HyperGeertz(HTM) as directly used online source). see also the subsequent 2001 Worldcat-entry. School building: a retrospective preface, in: Scott, Joan Wallach/ Keates, Debra (eds. ): Schools of Thought. Twenty-Five Years of Interpretive Social Science. Princeton/N.J./USA: Princeton University Press, pp. 1-13 (note: = "Papers of the 1997 conference that celebrated the twenty-fifth anniversary of the Institute for Advanced Study's School of Social Science"). Book review, full text only: http://www.wam.umd.edu/~mturn/WWW/cdss.html (on: Turner, Mark: "Cognitive Dimensions of Social Science: The Way We Think About Politics, Economics, Law, and Society", Oxford/UK etc. 2001: Oxford University Press). full text: "In extending the idea of 'cognitive studies' beyond psychology, artificial intelligence, information processing and linguistics to the social sciences as a whole, Turner has both deepened that idea and set it free of scientistic rigidities. His discussions of 'conceptual blending,' of 'the descent of meaning,' of analogy and metaphor, and of choice provide a powerful new framework for work in anthropology, literature, and rhetoric on the one hand and politics, law, and economics on the other. 'The second cognitive revolution,' the one concerned with meaning and understanding, seems at last at hand." (Contribution, Indonesian title not known), in: Indra Surya Lubis (ed. ): Bahaya tirani DPR: konflik DPR vs Presiden: kumpulan analisis para pengamat politik, [Jakarta/Jawa/IND 2001]: Lembaga Studi Politik "Merdeka", pp. ? (= translation of 00Aeng4?). Reply, in: Author Meets Critics: Anniversary Symposium (on 00Beng1): American Philosophical Association, Pacific Division, 75th annual Meeting, Main Session IV, March 30, 2001 (= reply to: Eze, Emmanuel (DePaul University); Fraser, Nancy (The New School); Galison, Peter (Harvard University); chair: Shrage, Laurie (Cal Poly Pomona)). Comments, at: Cultures, sociétés, et territoires: hommage à Clifford Geertz. Conference, May 4-6, 2001; organized by: (1) Municipal Council of Sefrou/MAR; (2) Princeton University’s Institute for the Transregional Study of the Contemporary Middle East, North Africa, and Central Asia (Princeton/N.J./USA); (3) King Abdul-Aziz Al Saoud Foundation of Casablanca/MAR (Fondation du Roi Abdul-Aziz al-Saoud pour les Etudes Islamiques et les Sciences Humaines de Casablanca). The conference (= the Sefrou Council's twelfth annual colloquium) brought together over one hundred scholars from Morocco and the Middle East, Europe, Asia and North America. Sefrou was the site of much of Professor Geertz's fieldwork as well as that of a generation of anthropologists working on the Maghreb under his direction. Papers presented at the conference dealt with a variety of issues central to Professor Geertz's pioneering work in the field of anthropology and, in particular, his work on North African cultures. 1. Petites villes et métropoles: coexistence, débats identitaires, multiculturalismes anciens et nouveaux. 2. Cultures et pratique culturelles: comparaison et usage des différences. 3. Histoire(s), mémoire(s) et espace(s) dans la construction des sociétés maghrébines modernes et contemporaines. 4. Discours et pratique du changement: transformation et utopie du passé et du présent. Quels cadres pour les vies futures ? contributors/ participants at the Sefrou conference were: Cohen, Yolande; Moussaui, Abderrahmane; Slyomovics, Susan; Peyron, Michael; Geertz, Clifford; and many others. The papers of the conference have not been published up to now (2013). Islam, identity and local culture: a comparative case. The Ninth annual Sabbagh lecture on Arabic Culture (sponsored by the anthropology department at the University of Arizona): Tucson/Az./USA, held Thursday, Feb. 22th, 2001. The original manuscript circulated as "Islam, identity and local culture". transcribed text (altered) = 01Weng1. this transcription also as HyperGeertz-Text. based on an original contribution to a conference fall 1990 in Oxford, held as hommage to Lucette Valensi; see 02Afre1. After writing culture, a discussion with Karl-Heinz Kohl, University of Frankfurt-Main/BRD (November 13, 2001, at the Staatsbibliothek-zu-Berlin/GER; chair: Werner Schiffauer, University of Frankfurt-Oder/BRD; within the series "Blickwechsel - Perspektiven der Wissenschaft", by the "Deutsche-Forschungsgemeinschaft" in collaboration with the "Staatsbibliothek-zu-Berlin" and the "Einstein-Forum", both Berlin/GER). Interview (with Noah Lauricella), contained in: Noah Lauricella: Clifford Geertz - Anthropological Ambassador, in: Lederman, Leon M./ Scheppler, Judith A. (ed. ): Portraits of Great American Scientists, Chicago/Il/USA: Prometheus Books, pp. ? (chapt. 1). Così la tragedia dell'11 settembre sta cambiando il mio paese. Intervista con l'antropologo Clifford Geertz (di Maurizio Viroli), in: La Stampa (Torino/ITA: Ed. la Stampa), 8. 10. 2001, Cultura e Spettacoli, p. 37. A mitologia de um antropólogo (= entrevista de Victor Aiello Tsu com Clifford Geertz), in: Folha de São Paulo (São-Paulo/BRA: Empresa Folha da Manhã S/A), no. ? (February 18, 2001), pp. ?. Waspada, Kawan, Waspadalah ... (Interview with ? around 00Aeng4: "Indonesia: starting over"), in: Kompas online (Jakarta/Java/IND: PT Kompas Cybermedia), no. ? (Sabtu, 10 Maret 2001), pp. ?. "Bærende kraft i udviklingen inden for den moderne antropologi, kulturantropologien, professor ved Institute for Advanced Studies, Princeton, USA; Med engelsk resume; Med litteraturhenvisninger." see for the English transcription the HyperGeertz-Text. see also the Worldcat-entry (online-file). Interpretace kultur: vybrané eseje. Praha/CZE 2001: Vydalo nakladatelství SLON (565 p.; = full translation of 73Beng1; trad. : Červinková, Hana; Hubinger, Václav; Humlíčková, Hedvika). see the detailled Czech book description. note: also registered 2000 with the publisher: Sociologické nakladatelství (Alena Miltová a Jirzí Ryba), Praha/CZE 2000). (12) "Thomas Kuhn: O texto Certo na hora certa", pp. ? (14) "Um ato desequilibrador: a Psicologia Cultural de Jerome Bruner", pp. ? (15) "Cultura, Mente, Cérebro/ Cérebro, mente e cultura", pp. ? (16) "O Mundo em pedaços: Cultura e política no fim do século", pp. ? (transcription of further Portuguese chapters not available yet). Los usos de la diversidad, in: Frade, Carlos (ed. ): La diversidad cultural en un mundo global: perspectivas antropológicas, Barcelona/SPA 2001: Universitat Oberta de Catalunya (Documento electrónico; = translation of 86Aeng1). El impacto del concepto de cultura en el concepto de hombre, in: página personal de CARLOS MANZANO (first visited 12/2001); full text only: http://www.inicia.es/de/cgarciam/geertz01.htm (= translation of 66Aeng2). »Schicksalsbedrängnis«: Religion als Erfahrung, Sinn, Identität, Macht, in: Sinn und Form. Beiträge zur Literatur (Berlin/GER: Herausgegeben von der Akademie der Künste), vol. 53, no. 6, pp. 742-759 (= translation of 99Aeng1). Vivre parmi les "anthros". Polémique sur les anthropologues en Amazonie, in: Ésprit (Paris/FRA: Revue Esprit), Juillet 2001, S. 20 (= translation of 01Aeng1). "Une polémique parcourt l'anthropologie américaine autour du peuple Yanomami. Anthropologues néodarwiniens, épidémiologistes, chercheurs d'or, touristes en mal de découvertes, journalistes d'investigation à l'affût du scandale se querellent tandis que ce peuple passe sans transition des premiers contacts avec la civilisation au péril de la disparition." (http://www.esprit.presse.fr/archive/abstract.cfm?id_numero=127&id_sommaire=4116). (transcription of the Turkish chapters not available). Az eszes vadember (Lévi-Straussról), in: Magyar Lettre Internationale (Budapest/HUN: Jelenkor Kiadó), no. 40 (2001), pp. 6-9 (= translation of 67Aeng2; trad./ fordítása: Varró Szusza). Osztályozó naptárak és a pontos idõ, in: Fejõs Zoltán (ed. ): Idõ és antropológia. Fordítások gyûjteménye. Budapest/HUN 2001: Osiris Könyvkiadó, pp. 103-111 (= translation of ?). also listed as edited in 2000. ”Fra den innfødtes synsvinkel”: om den antropologiske forståelsens egenart, in: Lægreid, Sissel, & Skorgen, Torgeir (red. ): Hermeneutisk lesebok, Oslo/NOR 2001: Spartacus forlag, pp. 289-305 (= translation of 74Aeng2; trad. ?). Antiprogres - Clifforda Geertza, in: Horgan, John (comp. ): Kraj znanosti, Zagreb/CRO 2001: Naklada Jesenski i Turk, pp. ? (= translation of 97Reng2; trad. : Rajka Rusan, Ognjan Stipić). Deep play: notes on the Balinese cockfight (1972), in: Tropp, Sandra Fehl/ Pierson-D'Angelo, Ann (eds. ): Essays in context. New-York/N.Y./USA etc. 2001: Oxford University Press, pp. 433-464 (= reprint of 72Aeng1). No: Clifford Geertz, in: Should cultural anthropology model itself on the natural sciences?, in: Endicott, Kirk M./ Welsch, Robert L. (eds. ): Taking sides: clashing views on controversial issues in anthropology. Guilford/Ct./USA 2001: McGraw-Hill/ Dushkin, pp. ? (= excerpt/ reprint of ?). The integrative revolution: primordial sentiments and civil politics in the new states, in: Pecora, Vincent P. (ed. ): Nations and identities: classic readings. Malden/Ma./USA & Oxford/UK 2001 etc. : Blackwell Publ., pp. 279-291 (chapter 30; = reprint of 63Aeng1). full text versions also: http://www.visualanthropology.com.cn/wenxian/ShowArticle.asp?ArticleID=349 (342). for a full table of content of the reader see: http://www.blackwellpublishing.com/contents.asp?ref=0631222081&site=1. Thick description: toward an interpretive theory of culture, in: Emerson, Robert M. (ed. ): Contemporary field research: perspectives and formulations. Prospect Heights/Ill./USA 2001: Waveland Press, pp. 55-75 (ch. 1 = reprint of 83Reng1). (illegal copy: without quoting HyperGeertz(HTM) & Questia as directly used online sources). second edition of Emerson (ed.) 2006.
second edition of Erickson (ed.) 2006. Thick description: toward an interpretive theory of culture, in: Denzin, Norman K./ Lincoln, Yvonna S. (eds): The American Tradition in Qualitative Research, Volume One: London/UK etc. 2001: Sage, pp. ? (Part one: history, ethics, politics and paradigms of inquiry) (= reprint of 73Aeng1). full text versions also: http://www.visualanthropology.com.cn/wenxian/ShowArticle.asp?ArticleID=433 (355). Soekarno daze, in: Latitudes magazine (Denpasar/Bali/INA: Teduh Mitra Utama), vol. 8 (September 2001), pp. 10-15 (= partial reprint of "Indonesia starting over" = 00Aeng4). also as HyperGeertz-Text (full version). ‘From the native's point of view’: on the nature of anthropological understanding, in: Bryman, Alan (ed. ): Ethnography, Volume One (The nature of ethnography), London/UK etc. 2001: Sage Publications, pp. ? (in part four: epistemology and ethnography; = reprint of 74Aeng2). see the table of content of the above 4-volume edition: http://www.sagepub.co.uk/book.aspx?pid=100668&sc=1. Deep play. Notes on the Balinese cockfight, in: Alexander, Jeffrey C. (ed. ): Mainstream and Critical Social Theory. Classical, Modern and Contemporary, Volume Six, London/UK & Thousand Oaks/Ca./USA etc. 2001: Sage Publications, pp. ? (part one continued: Research programs; = reprint of 72Aeng1). see the table of content of the above 8-volume edition: http://www.sagepub.co.uk/printerfriendly.aspx?pid=100071&ptype=B. Deep play: from 'Deep Play: Notes on the Balinese Cockfight', in: Counsell, Colin / Wolf, Laurie (eds. ): Performance analysis : an introductory coursebook, London/UK & New York/N.Y./USA 2001: Routledge, pp. 222-228 (= partial reprint of 72Aeng1). see a table of content of the above mentioned volume. (x) A vallás mint kulturális rendszer, pp. 72-118. (x) Mély játék. Jegyzetek a bali kakasviadalról, pp. 126-??. (x) "A bennszülöttek szemszögéből": Az antropológiai megértés természetéről, pp. ??-169. (x) Sűrű leírás. A kultúra értelmező elmélete felé, pp. 170-199. (x) A művészet mint kulturális rendszer, pp. 239-267. (x) Jelen lenni: az antropológia és az írás helyszíne, pp. ??. (x) A sokféleség édes haszna, pp. 374-396. (x) A bennszülöttek szemszögéből: az antropológiai megértés természetéről, pp. ??. (x) Az angol volt a főszakom. Regényíró akartam lenni. Regényeket írtam, novellákat, még verseket is, egy jó ideig ezzel foglalkoztam. (Richard Handler interjúja Clifford Geertzcel), pp. ??. A mitologia de um antropólogo (= entrevista de Victor Aiello Tsu com Clifford Geertz), in: REVER - Revista de Estudos da Religião (São-Paulo/BRA: Pontifícia Universidade Catolica de São Paulo; Pos-Graducacão em Ciencias da Religião), no. 3 (2001), pp. ? (= reprint of 01Ipor1). (illegal: without quoting HyperGeertz(HTM) and RAI as directly used online sources). (transcription of Lithuanian chapters not available). (transcription of further Japanese chapters not available yet). (preliminary Japanese description): クリフォード・ギアツ[著];小泉潤二編訳. 小泉潤二 解釈人類学と反=反相対主義. further book description not available yet. Beyond the Cultural Turn ("little review"), in: Common Knowledge (Durham/N.C./USA: Duke University Press; rem: = relaunched edition of the former Oxford University Press/N.Y./USA journal), vol. 8 no. 1 (2002), pp. 204-205 (= Book review on: Bonnell, Victoria E., & Hunt, Lynn Avery (eds. ): "Beyond the cultural turn. New Directions in the Study of Society and Culture", Berkeley/Ca./USA 1999: University of California Press). full text (subscribers only): http://muse.jhu.edu/cgi-bin/access.cgi?uri=/journals/common_knowledge/v008/8.1geertz.html. (illegal copy: without quoting HyperGeertz(HTM) and MUSE as directly used online sources). full text: http://www.nybooks.com/articles/article-preview?article_id=15671 (subscribers or charge). An inconstant profession: the anthropological life in interesting times, in: The Annual Revue of Anthropology (Palo Alto/Ca. : Annual Reviews), vol. 31 no. 1 (2002), pp. 1-19. "I give an overall view of anthropology and of my career within it over the past fifty years, relating them to changes in the world in general during that time. All lessons are implicit, all morals unstated, all conclusions undrawn". based on the lecture "An Inconstant Profession: The Anthropological Life in Interesting Time”, at the Columbia University, New York/N.Y./USA, School of Social Sciences, March 13, 2001.
full text: Annual Reviews (subscribers only): http://arjournals.annualreviews.org/doi/full/10.1146/annurev.anthro.31.040402.085449. Little Review, in: Common Knowledge (Durham/N.C./USA: Duke University Press; rem: = relaunched edition of the former Oxford University Press/N.Y./USA journal), vol. 8 no. 3 (2002), pp. ? (= Book review on: Todorov, Tzvetan:"Life in common: an essay in gerneral anthropology", Lincoln/Ne./USA 2001: University of Nebraska Press). Le Proche Orient en Extrême-Orient, in: François Pouillon (ed. ): Lucette Valensi à l’œuvre. Une histoire anthropologique de l’Islam méditerranéen. Mélanges offert à Lucette Valensi, St. Denis/FRA 2003: Éd. Bouchene (Ouvrage publié avec l'aide du Ministère de la Recherche et de l'EHESS), pp. ? (= (abridged?) Fench version of 01Weng1). "Les mélanges rassemblés dans ce volume ont pris leur source dans une réunion organisée à Oxford, le 1 et 2 avril 1990, par le centre d’histoire sociale de l’Islam Méditerranéen et accueilli par la maison Française d’Oxford, grâce au soutien de l’Ecole des Hautes Etudes en sciences sociales, le département of Middle-Eastern de l’université de Princeton, et l’appui du ministère de la recherche." see the English version as HyperGeertz-Text. (illegal copy: without quoting HyperGeertz(HTM) and IAS as directly used online source). full text available via http://ant.sagepub.com/cgi/reprint/2/4/421 (subscribers only). (illegal copy: without quoting HyperGeertz(HTM) and SAGE as directly used online sources). "I don't do systems." An interview with Clifford Geertz (with Arun Micheelsen), in: Method & Theory in the Study of Religion. Journal of the North American Association for the Study of Religion (Leiden/NED: Koninklijke Brill NV), vol. 14 no. 1 (1 March 2002), pp. 2-20 (first printed in the Danish translaion 01Idan1). also as HyperGeertz-Text (this text linked: http://www.kommunikationsforum.dk/tag/for--Interview med Clifford Geertz). Panel contribution: the teaching of language, in: Modern Language Association (New York/N.Y./USA), 118th Annual Convention (New York/N.Y./USA, Dec. 27-30, 2002), Panel discussion: teaching of language, Dec. 29, 2002.
see online citations in the report "The droves of Academe" (in: The New York Observer (New York/N.Y./USA: The New York Observer, L.P.), January 6, 2003, by Tom McGeveran and Rebecca Traister). Speech ("Prof. Geertz yang fasif berbahasa Indonesia ..."), March 12th, 2002, Princeton/N.J./USA, Institute of Advanced Study (on occasion of receiving the Indonesian "Award of Meritorious Achievement (Bintang Jasa Utame, First Class)"), tape recording available at: The Indonesian Embassy (Washington/DC/USA: www.embassyofindonesia.org). tape recording available at: The Indonesian Embassy (Washington/DC/USA: www.embassyofindonesia.org). Culture, Esprit, Cerveau / Cerveau, Esprit, Culture, in: Rastier, François/ Bouquet, Simon (eds. ): Une introduction aux sciences de la culture, Paris/FRA 2002: Presses Universitaires de France (coll. Formes sémiotiques), pp. ? (= translation of chapter 15 in 00Beng1 = transcription of 99Ieng4; trad: Jean-Michel Fortis). English version also as HyperGeertz-Text. La vida entre los "antros" (El saqueo de El Dorado, de Patrick Tierney), in: Revista de Occidente (Madrid/SPA: Alianza Editorial), vol. 256 (2002), pp. 85-107 (= translation of 01Aeng1). En la sección "Temas de Libros" el lector hallará una crítica de "El saqueo de El Dorado" de Patrick Tierney firmada por el antropólogo Clifford Geertz. (15)" El mundo en pedazos, cultura y política en el fin de siglo", pp. ? Obras e vidas: o antropologo como autor, Rio de Janeiro/BRA 2002: Editora UFRJ (Federal University of Rio de Janeiro) (= complete translation of 88Beng1 "Works and lives"; translation/ trad. : Vera Ribeiro). Świat w kawałkach – kultura i polityka u schyłku wieku, in: Wolska, Dorota/ Brocki, Marcin (red. ): Clifford Geertz – lokalna lektura, Kraków/POL 2002: Wydawnictwo Uniwersytetu Jagiellońskiego, pp. ? (= Übers. von 98Aeng1). (Korean characters need to be activated on your browser). Hayat dan karya: antropolog sebagai Penulis dan Pengarang. Yogyakarta/IND: LKiS (x, 169 p.; = translation of 88Beng1; trad./ diterjemahkan: ). Városok (Pare és Sefrou), in: Magyar Lettre Internationale (Budapest/HUN: Európai Kulturális Alapítvány), no. 45 (2002), pp. 67-70 (= translation of 99Beng1 (in part); trad./ ford. : Karádi, Éva). Az utolsó humanista, in: BUKSZ. Budapesti Könyvszemle (Budapest/HUN: Budapesti Könyvszemle BUKSZ), vol. 14 no. 4 (2002), pp. 400-404 (= translation of 02Aeng3; trad./ fordította: Széphelyi, F. György). SUMIŠĘ ŽANRAI. SOCIALINĖS MINTIES POKYČIAI, in: Literatūra ir menas. Leidžia Lietuvos rašytojų sąjungos (Vilnius/LIT: Interneto projektą remia), nr. 2910 (August 2002), online: http://www.culture.lt/lmenas/?leid_id=2910&kas=straipsnis&st_id=550 (= translation of 80Aeng2; trad. :/ Iš anglų k. vertė: Platelis, Edgaris). Deep play: notes on the Balinese cockfight, in: Adams, Rachel/ Savran, David (eds. ): The masculinity studies reader, Malden/Ma./USA & Oxford/UK etc. 2002: Blackwell Publishers, pp. 80-98 (chapter 5; = reprint of 72Aeng1). for a complete table of content of the reader see: http://www.blackwellpublishing.com/contents.asp?ref=0631226591&site=1. Religion as a cultural system, in: Lambek, Michael J. (ed): A reader in the anthropology of religion, Malden/Ma./USA & Oxford/UK 2002 etc. : Blackwell Publishers (Blackwell Anthologies in Social and Cultural Anthropology), pp. 61-82 (chapt. 4) (= reprint of 66Aeng1). full text versions also: http://www.visualanthropology.com.cn/wenxian/ShowArticle.asp?ArticleID=397 (388) (382) (367). Life in Common, in: Perl, Jeffrey M. (ed): Peace and Mind: Seriatim Symposium on Dispute, Conflict, and Enmity. Part 3: Diffidence, Humility, Weakness, and Other Strengths, Durham/N.C./USA 2002: Duke Univ. Press, pp. ? (= reprint of 02Aeng5). Anti Anti-Relativism, in: Darnell, Regna (ed. ): American anthropology, 1971-1995: papers from the American anthropologist, Arlington/Va./USA 2002: American Anthropological Association, & Lincoln/Ne./USA 2002: University of Nebraska Press, pp. 416-439 (= reprint of 84Aeng4). Thick description: toward an interpretive theory of culture, in: Spillman, Lynette (ed. ): Cultural sociology, Malden/Ma./USA & Oxford/UK etc. 2002: Blackwell Publishers, pp. 63-68 (= reprint of 73Aeng1). for the full table of content of the reader see: http://www.blackwellpublishing.com/contents.asp?ref=0631216529&site=1. Art as a cultural system, in: Araeen, Rasheed/ Cubitt, Sean/ Sardar, Ziauddin (eds): Third Text Reader on Art, Culture and Theory, New York/N.Y./USA: Continuum Publishing, pp. ? (= reprint of 76Aeng1). La interpretación de las culturas, Santiago de Chile/CHI 2002: s.n. (3 sound cassettes (ca. 180 min. stèreo); Material con etiquetas en Braille. Lectura tomada de la edición impresa de 1990 (= first sound-book based on the 1990 South-American edition of the "Interpretation of cultures" translation (87Tspa1), the original published in English as 73Beng1 "The interpretation of cultures"; the cassettes comprise a selection from the original body of texts by Cifford Geertz). cassette 1: Descripción densa: hacia una teoria interpretativa de la cultura (2a. parte only). cassettes 2 y 3: Impacto de cultura en el concepto de hombre. the speaker of the sound cassettes is Marvin Harris. Investigaciones en antropología política, Santiago de Chile/CHI 2002: s.n. (3 sound cassettes (ca. 180 min. stèreo); Material con etiquetas en Braille. Lectura tomada de la edición impresa de 1990 (= second sound book based on the 1990 South-American edition of the "Interpretation of cultures" translation (87Tspa1), the original published in English as 73Beng1 "The interpretation of cultures"; the cassettes comprise a selection from the original body of texts by Cifford Geertz). cassette 1 & 2 (Cap. 1-3): Ultimo circulo. cassette 3 (Cap. 6): Cuestio del poder en las sociedades primitivas. the speakers of the sound cassettes are Pierre Clastres and Adriana Binimelis Sáez. 地方知識: 詮釋人類學論文集: Di fang zhi shi: quan shi ren lei xue lun wen ji ("Local knowledge", 2nd Chinese edition). Taipeh/TWN 2002: Mai tian chu ban she, 麦田出版 (324 p., ISBN 986-7895-77-0; = translation of 83Beng1; reprint of 00Tchn1; trad. : 楊 德睿/ Derui Yang). a second, revised Taiwanese edition was printed 2007: 07Rchn1. Off the menu, in: The New Republic (New-York/N.Y./USA: The New Republic Pub. Co.), vol. 205 (2003) (= no. 4596), S. 27-30 (= book review on: Tyler Cowen: "Creative destruction: how globalization is changing the world's cultures", Princeton/N.J./USA 2002: Princeton Univ. Press). full text available via "EBSCO-AcademicSearchPremier" (subscribers only). (illegal copy: without quoting HyperGeertz(HTM) and EBSCO as directly used online sources). Book review (little review), in: Common Knowledge (Durham/N.C./USA: Duke University Press), vol. 9 no. 3 (fall 2003), p. 541 (= book review on: Zammito, John H.: Kant, Herder, and the birth of anthropology, Chicago/Il./USA 2002: Univ. of Chicago press). full text: http://muse.jhu.edu/journals/common_knowledge/v009/9.3geertz.pdf (subscribers only). Book review, in: Additional reviews and endorsments for Neiman, S.: Evil in modern thought, Princeton University Press announcement, online only: http://pup.princeton.edu/quotes/q7350.html (on: Susan Neiman: "Evil in Modern Thought: An Alternative History of Philosophy", Princeton/N.J./USA 2002: PUP). full text online via MLA (subscribers only). The Human Touch. Interview with Ira Flatow, in: Thinking Big. Big Ideas, part 4. A TV Production of Thirteen/WNET New York/N.Y./USA, © 2003 Educational Broadcasting Corporation; broadcasted nationwide, f.e. in New York at WNET (5/1/03 - 10:00 PM; 5/4/03 - 12:00). audio recording available at the research-center. Local Knowledge and Human Interests, keynote speech at: Symposium "Localizing the Global; Globalizing the Local: Rethinking local knowledge and constructions of gender, race and nation”, Center for the Study of Local Knowledge, University of Virginia, Charlottesville/Va./USA, April 11th, 2003 (audio recording available at the center). Interview with Clifford Geertz (by John Gerring, Boston University), in: Qualitative Methods: Newsletter of the American Political Science Association Organized Section on Qualitative Methods, vol. 1 no. 2 (Fall 2003), pp. ? (Transcription by Jennifer Jefferis; editing by John Gerring). Le souk de Sefrou. Sur l'économie de bazar (trad. Daniel Cefaï). Saint-Denis/FRA 2003: Éditions Bouchene (263 pp. ; collection Intérieurs du Maghreb; = translation of 79Aeng1). note: "Ouvrage publié avec le concours du Centre National du Livre; Traduction de la seconde partie de: Meaning and order in Moroccan society / Clifford Geertz. Cambridge : Cambridge University Press, 1979. "see also the (extensive) HyperGeertz-Abstract in French (on the English source: 79Aeng1). see also a presentation & review via the publisher: HyperGeertz-Review. Darabokból álló világ (a kultúra és a politika térképének megváltozása), in: Magyar Lettre Internationale (Budapest/HUN: Európai Kulturális Alapítvány), no. 49 (2003), pp. 17-20 (= translation of 94Beng1 (in part; trad./ fordításan: Karádi Éva). (illegal copy: without quoting HyperGeertz(HTM) and C3.hu as directly used online source). Opis gęsty - w stronę interpretatywnej teorii kultury, in: Kempny, Marian, & Nowicka, Ewa (red. ): Badanie kultury. Elementy teorii antropologicznej, Warszawa/POL 2003: Wydawnictwo PWN (Elementy teorii antropologicznej - wprowadzenie 7), pp. 36-58 (= translation of 73Aeng1; trad./ tlum. : Sławomir Sikora). Zastane światło. Antropologiczne refleksje na tematy filozoficzne (przekład (introd.) Pucek, Zbigniew), Kraków/POL 2003: Universitas Towarzystwo Autorów i Wydawców Prac Naukowych (351 pp.) (= translation of 00Beng1; trad./ tlum. : Pucek, Zbigniew). Świat w kawałkach – kultura i polityka u schyłku wieku, in: Wolska, Dorota, & Brocki, Marcin (red. ): Clifford Geertz – lokalna lektura, Kraków/POL 2003: Uniwersytet Jagiellońsi, pp. ? (= translation of 96Bger1 (in part) via 00Beng1 (chapt. 16); trad./ tlum. : Pucek, Zbigniew). Myślenie jako działanie moralne: etyczny wymiar antropologicznych badań terenowych w nowopowstałych państwach, in: Wolska, Dorota, & Brocki, Marcin (red. ): Clifford Geertz – lokalna lektura, Kraków/POL 2003: Uniwersytet Jagiellońsi, pp. ? (= translation of 68Aeng1 via 00Beng1 (chapt. 3); trad./ tlum. : Zbigniew Pucek). "Nevytváram systémy": Rozhovor s Cliffordom Geertzom (interview with Arun Micheelsen), in: Kritika & Kontext. Casopis kritického myslenia / Journal of critical thinking (Bratislava/SLK), no. 3/2003, pp. ? (= translation of 02Ieng2; trad./ z angličtiny preložil: Martin Kanovský). Kritika & Kontext is a quarterly, bi-lingual (Slovak & English) journal of book reviews based in Bratislava, Slovakia. The hereby published translation contains also "Poznámky k rozhovoru s C. Geertzom" (Concluding Remarks by A. Micheelsen to the Interview with C. Geertz). this version (interview & concluding remarks) also as HyperGeertz-Text. (illegal copy: without quoting HyperGeertz(HTM) and KRITIKA as directly used online sources). Studi sul Islam, in: La Rivista dei Libri (Firenze/ITA: La Rivista dei Libri S.R.L. ), vol. 11 no. 10 (ottobre 2003), pp. ? (book review on: Gilles Kepel, Jihad, ascesa e declino: storia del fondamentalismo islamico, Roma, Carocci; Daniel Pipes, Militant Islam Reaches America, New York, Norton; Stephen Schwartz, The Two Faces of Islam: The House of Sa'ud from Tradition to Terror, New York, Doubleday; Paul Berman, Terror and Liberalism, New York, NortongGraham E. Fuller, The Future of Political Islam, New York, Palgrave; Noah Feldman, After Jihad: America and the Struggle For Islamic Democracy, New York, Farrar, Straus and Giroux; Riaz Hassan, Faithlines: Muslim Conceptions of Islam and Society, Oxford, Oxford University Press; Muhammad Qasim Zaman, The Ulama In Contemporary Islam: Custodians of Change, Princeton, Princeton University Press; = translation of 03Aeng3; trad. Alessio Catania). (illegal copy: without quoting HyperGeertz(HTM) and REVISTA as directly used online source). Alla scoperta dell'Islam, in: La Rivista dei Libri (Firenze/ITA: La Rivista dei Libri S.R.L. ), vol. 11 no. 9 (settembre 2003), pp. 6-10 (book review on: Bernard Lewis, Il suicidio dell'Islam. In che cosa ha sbagliato la civiltà mediorientale, Milano, Mondadori; Id., The Crisis of Islam: Holy War and Unholy Terror, Londra, Weidenfeld & Nicolson; Thomas W. Simons Jr., Islam in a Globalizing World, Stanford, Stanford Law and Politics; M.J. Akbar, The Shade of Swords: Jihad and the Conflict Between Islam and Christianity, Londra, Routledge; Karen Armstrong, L'Islam, Milano, Rizzoli; (= translation of 03Aeng2). (illegal copy: without quoting HyperGeertz(HTM) and TELESKOP as directly used online source). Blurred genres: the refiguration of social thought, in: Philip Auslander (ed. ): Performance: critical concepts, vol. I part 1 no. 11, London/UK & New York/N.Y./USA 2003: Routledge, pp. ? (= reprint of 80Aeng2). Ritual and social change: a Javanese example, in: Murphy, Robert F. (ed. ): American anthropology, 1946-1970: papers from the American anthropologist, Lincoln/Ne./USA 2003: University of Nebraska Press, pp. ? (= reprint of 57Aeng2). (illegal copies: without quoting HyperGeertz(HTM), jstor or Questia as directly used online sources). The social scientist as author, in: Olson, Gary A./ Worsham, Lynn (eds. ): Critical intellectuals on writing, Albany/N.Y./USA 2003: State University of New York Press, pp. ? (= reprint of 91Ieng2). Thick description: toward an interpretive theory of culture, in: Lincoln, Yvonna S./ Denzin, Norman K. (eds. ): Turning points in qualitative research: tying knots in a handkerchief, Walnut Creek/Ca./USA 2003: AltaMira Press, pp. 143-168 (= reprint of 73Aeng1). Historia y antropologia, in: Historias (México/D.F./MEX: Instituto Nacional de Antropología e historia), no. 55, may-agosto 2003, pp. 8-21.
reprint of 92Tspa1; = translation of 90Aeng1. "Thick description", in: Bertolotti, Giorgio (a cura di; in collaborazione con Salvatore Natoli, Carlo Sini, Gianni Vattimo, Vincenzo Vitiello): Ermeneutica, Milano/ITA: Raffaello Cortina (coll. “Bibliotheca”), 2003, pp. 309ff. (= reprint of 87Tita1, chapt. 1). What is a state if it is not a sovereign: reflections on politics in complicated places, in: Current Anthropology (Chicago/Ill./USA: University of Chicago Press; ed. by: The Wenner-Gren Foundation for Anthropological Research), 45 (2004), pp. 577-593 (note = "Paper, delivered as the tenth annual Sidney W. Mintz Lecture in Anthropology on November 12, 2003, at the Johns Hopkins University, Baltimore/Md./USA"). available also as offprint (limited edition). see a commentary within CA (Current Anthropology): Comment, pp. 593-594.
also as Abstracts: HyperGeertz-Abstract1; HyperGeertz-Abstract2. full text: http://www.nybooks.com/articles/article-preview?article_id=17450 (subscribers or charge). see also the reply by Orin Starn: http://www.nybooks.com/articles/17529 (subcribers or charge). (without quoting HyperGeertz(HTM) and NYRB as directly used online sources). Compte rendu (Book review), in: L'homme. Revue française d'anthropologie (Paris/FRA: EHESS), no. 169 (2004; no. spécial "Le sorcier, le nom, la filiation"), pp. 285-287 (= Book review on: (1) Leo Howe: "Hinduism and Hierarchy in Bali", Oxford/UK 2001: James Currey, & Santa Fe/N.M./USA 2001: School of American Research Press; (2) David J. Stuart-Fox: "Pura Besakih:Temple, Religion and Society in Bali", Leiden 2002, KITLV Press). (without quoting HyperGeertz(HTM) and l'HOMME as directly used online sources). Book review, in: American Anthropologist (Arlington/Va./USA: American Anthr. Association), vol. 106 (2004) no. 2, p. 420 (= Book review on: Mrázek, Rudolf : "Engineers of Happy Land: Technology and Nationalism in a Colony", Princeton/N.J./USA 2002: Princeton University Press). full text via: http://www.anthrosource.net/doi/pdf/10.1525/aa.2004.106.2.420 (subscribers or charge). now available as JSTOR-freeware (pdf-image only). also as HyperGeertz-Text (work in progress). Book review, in: American Anthropologist (Arlington/Va./USA: American Anthr. Association), vol. 106 (2004) no. 3, p. 622 (= Book review on: Hüsken, Frans, de Jonge, Huub (eds. ): "Violence and Vengeance. Discontent and Conflict in New Order Indonesia", Saarbrücken/GER 2002: Verlag für Entwicklungspolitik). full text via: http://www.anthrosource.net/doi/pdf/10.1525/aa.2004.106.3.622 (subscribers or charge). Reply, in: Current Anthropology. A world journal of the sciences of man (Chicago/Ill./USA: Univ. of Chicago Press), vol. 45, no. 5 (December 2004), pp. 591-593. Curriculum vitae. May 2004, in: Institute for Advanced Study, School of Social Sciences (ed): Community: Faculty: Emeritus, Princeton/N.J./USA 2004: online publication: http://www.sss.ias.edu/community/faculty-cv/geertzcv.pdf. (without quoting HyperGeertz(HTM) as directly used online source). Esistere è avere fiducia nel proprio modo d’essere. Rituali come sistimi modello, in: Cimmino, Luigi/ Satambrogio, Ambrogio (eds. ): Antropologia e interpretazione. Il contributo di Clifford Geertz alle scienze sociali. Perugia/ITA: Morlacchi Editore, pp. 211-30 (Antropologia e scienze sociali, no. 1)(= revised & translated version of 99Ieng1). English original version published later as 07Aeng1. (= also (? ): lecture delivered in Perugia, 2003, as part of a workshop accompanying the exhibition "Il Perugino"). One hour lecture given by Clifford Geertz on May 6, 2004, Centre for Research in the Arts, Social Sciences, and Humanities, University of Cambridge/UK . (without quoting HyperGeertz(HTM) and DSPACE as directly used online source). see the report: http://www.nysun.com/article/5126 (subscribers only): "ANTHROPOLOGY OF INTRODUCTIONS: A professor emeritus at the Institute for Advanced Study at Princeton University, Clifford Geertz, delivered the ninth annual Irving Howe memorial lecture at the CUNY Graduate Center. Mr. Geertz's topic was: "What Was the Third World Revolution? "; A professor at CUNY Graduate Center, Morris Dickstein, introduced CUNY Graduate Center's provost, William Kelly, who introduced another CUNY Graduate Center professor, Talal Asad, who, in turn, introduced Mr. Geertz. When Mr. Kelly's kudos-filled introduction of Mr. Asad was far longer and more elaborate than that of Mr. Asad's of Mr. Geertz. Mr. Asad explained that introductions are not overtly rational, otherwise the most eminent among the crowd, Mr. Geertz, would be introducing the other speakers. Mr. Asad said rather, the purpose of introductions is to honor. The Oxford-educated Mr. Asad described Mr. Geertz among the two or three most renowned anthropologists of the last 50 years. The audience chuckled when Mr. Asad added self-effacingly, "and the other two are not me." After this lengthy process, the audience laughed when Mr. Geertz began by saying, "I feel well introduced." Among those in attendance were political philosopher Michael Walzer, who serves as co-editor of Dissent magazine; philanthropist Max Palevsky, who sponsored the lecture series, and many others." (text for subcribers only - and only as part of the very expensive complete issue). see also the Russian HyperGeertz-Abstract. "Die Wiederverzauberung der Welt": Gustavo Gutiérrez und Clifford Geertz im Gespräch (Konzeption und Moderation: Constantin von Barloewen, Paris); Debatte Schloss Neuhardenberg (Neuhardenberg b. Berlin/BRD), 5. Juni 2004 (Reihe "Babylon ist überall"), tape recording available at the "Stiftung Neuhardenberg", transmitted partially in: das kulturradio (Berlin/BRD 2004: Rundfunk Berlin-Brandenburg), exact date not available (information request stil running)). Source text: "Mit einer Debatte unter dem Titel »Die Wiederverzauberung der Welt« wird die Reihe »Babylon ist überall« am Samstag, 5. Juni 2004, 20 Uhr, im Großen Saal von Schloss Neuhardenberg fortgesetzt. Es debattieren Gustavo Gutiérrez, Begründer der Befreiungstheologie, Professor für Theologie und Sozialwissenschaften an der Katholischen Universität in Lima, und der Anthropologe Clifford Geertz, Professor für Sozialwissenschaften am Institute of Advanced Study in Princeton, der neben Claude Lévi-Strauss zu den einflußreichsten Vertretern seines Faches gehört. Der Dialog wird von dem bekannten Pariser Kulturanthropologen Constantin von Barloewen moderiert." Observando o Islã: o Desenvolvimento Religioso no Marrocos e Indonésia, Rio de Janeiro/BRA 2004: Jorge Zahar (141 p., Coleção Antropologia Social; apresentação: Velho, Gilberto; = trad. of 68Beng1; tradução: Dentzien, Plínio). including: "Apresentação: Clifford Geertz e o 'selvagem cerebral': do mandala ao círculo hermenêutico", by John Cowart Dawsey. Hegemóniák, in: Magyar Lettre Internationale (Budapest/HUN: Európai Kulturális Alapítvány), no. 51 (2004), pp. 23-27 (= translation of ? ; trad./ fordítása: Orzóy, Ágnes). (without quoting HyperGeertz(HTM) and C3.hu as directly used online sources). Országok, in: Magyar Lettre Internationale (Budapest/HUN: Európai Kulturális Alapítvány), no. 53 (2004), pp. ? (= translation of ? ; trad./ fordítása: Orzóy, Ágnes). Kultūrų profiliai, Vilnius/LIT 2004: Baltos Lankos (forthcoming; ? pp.= translation of ? ; trad: ). remark: first announcement, not published under this title, but later as 05Blit1. Pengetahuan lokal, Yogyakarta/IND 2004: Merapi rumah penerbitan (? pp. = translation of 83Beng1; trad: ?). (Indonesia starting over, Indonesian title not known), in: Zen, Fathurin/ Fuad, Mustafid (ed./ introd. ): NU politik: analisis wacana media, Yogyakarta/Jawa/IND: LKiS, pp. ? (= translation of 00Aeng4; trad./ diterjemahkan: ?). other contributions are by: Barton, Greg; Berger, Peter L.; Binder, Leonard; Fealy, Greg; Feith, H.; Hefner, Robert W.; Horikoshi, K.D. ; Jackson, Serta; Steenbrink, Karel A.
Путь и случай: Жизнь в науке (Put i slutsai: schisn w' nauke); in: НЛО. Независимый филологический журнал (Novoe literaturnoe obozrenie; Moskva/RUS: NLO; see: http://www.nlo.magazine.ru), no. 70 (2004), pp. ? (= translation of 99Beng1 "Life of Learning"; пер. с англ. и примеч./ trad. & introd. by: Зорина, А. Л./ Zorin, A. L.). (without quoting HyperGeertz(HTM) and NLO as directly used online sources). (0) “Предисловие”, pp. 5-8 (translation of "Preface", пер. : Е.М. Лазарева, ред. : А.Л. Елфимов). (1) "«Насыщенное описание»: в поисках интерпретативной теории культуры", pp. 9-42 (translation of "Thick description: toward an interpretive theory of culture", пер. : Е.М. Лазарева, ред. : А.Л. Елфимов). (2) “Влияние концепции культуры на концепцию человека”, pp. 43-68 (translation of "The impact of the concept of culture on the concept of man", пер. : Е.М. Лазарева, ред. : А.Л. Елфимов). (3) “Развитие культуры и эволюция разума”, pp. 69-103 (translation of "The growth of culture and the evolution of mind", пер. : В.Г. Николаев). (4) “Религия как культурная система”, pp. 104-148 (translation of "Religion as a cultural system", пер. : Е.М. Лазарева, ред. : А.Л. Елфимов). (5) “Этос, картина мира и анализ священных символов”, pp. 149-167 (translation of "Ethos, world-view and the analysis of sacred symbols", пер. : А.А. Борзунов). (6) “Ритуал и социальные изменения: яванский пример”, pp. 168-200 (translation of "Ritual and social change: a Javanese example", пер. : А.А. Борзунов). (7) “«Внутреннее обращение» на современном Бали”, pp. 201-224 (translation of "Internal conversion” in contemporary Bali", пер. : А.А. Борзунов). (8) “Идеология как культурная система”, pp. 225-267 (translation of "Ideology as a cultural system", пер. : Г.М.Дашевский). (9) “После революции: судьба национализма в новых государствах”, pp. 268-292 (translation of "After the revolution: the fate of nationalism in the new states", пер. : О.В. Барсукова, А.А. Борзунов). (10) “Интеграционная революция: изначальные чувства и гражданская политика в новых государствах”, pp. 293-361, (translation of "The integrative revolution: primordial sentiments and civil politics in the new states", пер. : А.А. Борзунов). (11) “Политика смысла”, pp. 362-380 (translation of "Politics of meaning", пер. : О.В. Барсукова, А.А. Борзунов). (12) “Политика прошлого, политика настоящего: некоторые заметки о пользе антропологии для понимания феномена новых государств”, pp. 381-397 (translation of "Politics past, politics present: some notes on the uses of anthropology in understanding the new states", пер. : О.В. Барсукова). (13) “Мыслящий дикарь: о работе Клода Леви-Строса”, pp. 398-414 (translation of "The cerebral savage: on the work of Claude Levi-Strauss", пер. : Е.М. Лазарева, ред. : A.B. Матешук). (14) “Личность, время и поведение на Бали”, pp. 415-472 (translation of "Person, time, and conduct in Bali: an essay in cultural analysis", пер. : Е.М. Лазарева, ред. : A.B. Матешук). (15) “Глубокая игра: заметки о петушиных боях у балийцев”, pp. 473-522 (translation of "Deep play: notes on the Balinese cockfight", пер. : Е.М. Лазарева, ред. : A.B. Матешук). 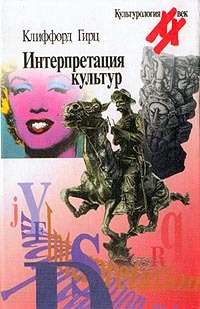 (16) “Клиффорд Гирц: интерпретация культур”, pp. 523-551 (by А.Л. Елфимов). (17) “Указатель имен”, pp. 552-558 (= Name index, сост. : И.А. Осиновская). (18) “Содержание”, p. 559 (= Contents). thanks to Alexei Kossykh, St. Petersburg ! see the Russian review of this book as HyperGeertz-Review. Базарная экономика: информация и поиск в сельском маркетинге, in: Журнал социологии и социальной антропологии. 2004. Т. VII. № 3. pp. 153-160 (= translation of 78Aeng1 "The bazaar economy: information and search in peasant marketing"; translated/ by: see at the end of the HyperGeertz-Text, p. 159). Blurred genres: the refiguration of social thought, in: Bial, Henry (ed): The Performance Studies Reader, London/UK & New York/N.Y./USA etc. 2004: Routledge, pp. 64-67 (= reprint of 80Aeng2). Being there, in: Seale, Clive (ed. ): Social research methods: a reader, London/UK & New York/N.Y./USA 2004: Routledge, pp. 236-240 (= reprint of chapter 1 in 88Beng1). Selected reading: The impact of the concept of culture on the concept of man, in: Delaney, Carol: Investigating Culture. An Experiential Introduction to Anthropology, Malden/Ma./USA & Oxford/UK etc. 2004: Blackwell Publishers, pp. ? (in section 9: VIPs - Very Important People, Places, Performances; = reprint of 66Aeng2). full text versions also: http://www.visualanthropology.com.cn/wenxian/ShowArticle.asp?ArticleID=421 (360). The Bazaar economy: Information and search in peasant marketing, in: Networks (Elgar Reference Collection. Critical Studies in Economic Institutions, Cheltenham/UK & Northampton/Mas./USA: Elgar), Volume 2, 2004, pp. 422-26 (= reprint of 78Aeng1). The visit, in: Angeloni, Eduardo (ed. ): Annual editions of Anthropology 2004/(2005), Guildford/UK etc. 2004: McGraw-Hill/Dushkin, pp. 95-100 (= reprint of 01Aeng3). Comment (on: Georgy Egorov/ Konstantin Sonin: Dictators and Their Viziers: Agency Problems in Dictatorships, Moscow/RU 2004: New Economic School, Working Paper # WP/2004/048 E.), unpublished working material, Moscow/RU 2004: Rossiyskaya Ekonomichekskaya Shkola (New Economic school), 3 pp. see: Егоров, Г.A./ Coнин, K.E. : Диктаторы и советники: агентские отношения при диктатурах. / Препринт # WP/2004/048 E. - Мoскьа/Рос. 2004: Российская Экономическая Школа, p. 1: "The research was supported by Ford Foundation, World Bank, John D. and Catherine T. MacArthur Foundation. The first author acknowledges financial and professional support of Economic Education and Research Consortium (grant № 04-0711). We thank Akhmed Akhmedov, Clifford Geertz, Sergei Guriev, Andrew Kydd, Aleksey Makrushin, Eric Maskin, Shlomo Weber, and Ksenia Yudaeva for valuable comments." Kultūrų interpretavimas. Vilnius/LIT 2005: Baltos Lankos (368 p.; translated by Antanas Danielius, Arūnas Gelūnas, Edgardas Platelis, Ingrida Tatolytė); contains translated articles from 1973Beng1 & 1983Beng1 (= translations of: 57Aeng1, 62Aeng1, 64Aeng2, 66Beng1, 66Aeng1, 72Aeng1, 73Aeng1, 74Aeng2, 75Aeng1, 76Aeng1, 80Aeng2). Commentary, in: Shweder, Richard/ Goode, Byron (eds. ): Clifford Geertz by his colleagues, Chicago/Il./USA 2005: University of Chicago Press, pp. 108-124.
reprinted as "Adapt or perish", in: Australian Financial Review (Sydney/AU: Fairfax Digital), March 17, 2005, online: http://afr.com/articles/2005/03/17/1110913733219.html. What was the Third World revolution?, in: Dissent. Independant social thought since 1954 (New York/N.Y./USA: Foundation for Study of Independent Ideas, Inc.), vol. 2005 (winter 2005; online), pp. 35-45 (= printed version of 04Ieng3). (illegal copy: without quoting HyperGeertz(HTM) and DISSENT as directly used online source). Letter 'Very bad News', in: The New York Review of Books (New York/N.Y./USA: A. W. Ellsworth, etc. ), vol. 52 no. 10 (June 9, 2005), pp. ? Shifting aims, moving targets: on the anthropology of religion, in: Journal of the Royal Anthropological Institute (Oxford etc. : Blackwell; ed: Roy.Anthr.Inst. ), vol. 11 no. 1 (spring 2005), pp. 1-15.
printed version (revised) of 04Ieng1. (without quoting HyperGeertz(HTM) and INGENTA as directly used online source). "Notes sur Clifford Geertz et le politique", suivi d'un entretien avec Clifford Geertz (interviewer: Yohann Aucante), in: Raisons poltiques. Etudes de pensée politique (Paris/FRA: Presses de Sciences Po), N° 18 (mai 2005), pp. ? (théme: "Théories en crise"). Systems of Meaning. Hans Ulrich Obrist interviews Clifford Geertz, in: berliner (Berlin/GER: Berliner Magazine), no. 05 (2005), pp. ?. Contribution (with Sari Nusseibeh, Robert Weisbuch, Lawrence Jones, Alick Isaacs, Jeffrey Perl, and others), to: Conference on Middle East Peace, Skidmore College (Saratoga Springs/N.Y./USA), May 12-13, 2005 (co-organized by the journal "Common knowledge" (Duke University Press), Durham/N.C./USA) (published as 2006Aeng2). Interview: Clifford Geertz (Hans Ulrich Obrist intervista il famoso antropologo americano; a cura di Thomas Boutoux, Loredana Mascheroni), in: Domus Magazine (Rozzano-Milano/IT: Editoriale Domus spa. ), no. 880 (aprile 2005), pp. 105-108 (= transl. of 05Ieng1 ?). Die Dritte Welt. Vom Fanal der Revolution zur postkolonialen Realitätsbewältigung, in: Lettre International. Europas Kulturzeitung (Berlin/GER: Lettre International Verlag), no. 69 (2005), pp. 46-52 (= (partial ?) translation of 05Aeng3; trad./ übers. : Herwig Engelmann). Le rivoluzioni incompiute del "terzo mondo", in: Reset. Un mese di idee (Milano/ITA: Editore Reset srl), no. 90 (Luglio - Agosto 2005: "Il ritorno della religione"), pp. ? (sezione "Pensare un globo in frantumi. Perché le categorie concettuali della filosofia politica moderna non bastano più" = (partial ?) translation of 05Aeng3; traduzione di ?). Que reste-t-il des révolutions du tiers monde?, in: Revue Ésprit (Paris/FRA: Éd. Ésprit), no. 6/2005 (Juin 2005: "Les questions de 1905"), pp. ? (section "Démocratisation, nationalisme et construction des états" = (partial ?) translation of 05Aeng3; traduit de ?). A singgahani medresze, in: Magyar Lettre Internationale (Budapest/HUN: Európai Kulturális Alapítvány), no. 55 (2005), pp. ? (= translation of 05Aeng3; trad./ fordítása: Orzóy, Ágnes). (without quoting HyperGeertz(HTM) and C3.hu as directly used online source). Wiedza lokalna. Dalsze eseje z zakresu antropologii interpretatywnej, Kraków/POL 2005: Wydawnictwo Uniwersytetu Jagiellońskiego (251 p., = translation of 83Beng1; trad./ tłum. z jęz. ang. : Wolska Dorota). (further description of Polish chapters not available yet). Interpretacja kultur. Wybrane eseje, Kraków/POL 2005: Wydawnictwo Uniwersytetu Jagiellońskiego (533 p., = translation of 73Beng1; trad./ tłum. z jęz. ang. : Piechaczek, Maria M., et al.). note: "Podstawa tł. : The interpretation of cultures: selected essays. New York, 2000. With new preface. Oryg. : 1973. Indeksy". 'Avodot te-yayim. Ha-antropolog ki-me'aber, Tel-Aviv/ISR: Resling (189 p., = translation of 88Beng1; trad./ me-Anglit: Ohad Zehavi; series: Libido - Sotsyologyah/Antropologyah (ליבידו : סוציולוגיה אנתרופולוגיה). (Hebrew description) עבודות וחיים : האנתרופולוג כמחבר / קליפורד גירץ ; תרגום מאנגלית - אהד זהבי ; עריכה מדעית - אנדרה לוי. ‫ תל אביב : רסלינג, 2005. Life without Fathers or Husbands, in: Spradley, James/ McCurdy, David W. (eds): Conformity and Conflict: Readings in Cultural Anthropology, 12th edition, Boston/MA/USA 2005: Allyn & Bacon, pp. ? (= reprint of 01Aeng3). Local knowledge (excerpt), in: Moore, Sally Falk (ed. ): Law and anthropology. A reader, Malden/MA/USA 2005: Blackwell, pp. 12-19 (= partial reprint of 83Aeng2). see the table of content. Deep play: notes on the Balinese cockfight, in: Daedalus (Cambridge/MA/USA: American Academy for Arts and Sciences/ MIT Press), vol. 134, no. 4 (Fall 2005), pp. 56-86 (= reprint of 72Aeng1). The special edition "50 years [of 'Daedalus']", contains: Limiting science: a biologist's perspective (1978)/ David Baltimore - Fear & loathing of the imagination in science (1998)/ Lorraine Daston - Physics & history (1998)/ Steven Weinberg - Civil religion in America (1967)/ Robert N. Bellah - Deep play: notes on the Balinese cockfight (1972)/ Clifford Geertz - How did economics get that way & what way did it get? (1997)/ Robert M. Solow - Reciprocal measures for arms stabilization (1960)/ Thomas C. Schelling - Two worlds of race (1965)/ John Hope Franklin - Politics, pedagogy & gender (1987)/ Jill K. Conway - Cultural China (1991)/ Tu Wei-ming - Indian traditions (1997)/ Amartya Sen - On Emerson (1959)/ Robert Frost - Modern & postmodern aesthetics (1985)/ Umberto Eco - On beauty (2002) / Susan Sontag. new electronic version "Deep play: notes on the Balinese cockfight. An article from Daedalus [HTML]", offered by Thomson Gale via amazon.com. Thick description: toward an interpretive theory of culture, in: Moore, Henrietta/ Sanders, Todd (eds. ): Anthropology in Theory. Issues in Epistemology, Malden/MA/USA & Oxford/UK 2005: Blackwell Publishers, pp. ? (chapter 21; = reprint of 73Aeng1). Whose life is it anyway?, in: Pole, Christopher John (ed. ): Fieldwork, Volume Four (Fieldwork analysis, outcomes and reflections), London/UK & Thousand Oaks/Ca./USA etc. 2005: Sage Publications, pp. ? (in part 2/2; = reprint of 88Beng1, chapter 6). Being there, in: Pole, Christopher John (ed. ): Fieldwork, Volume Four (Fieldwork analysis, outcomes and reflections), London/UK & Thousand Oaks/Ca./USA etc. 2005: Sage Publications, pp. ? (in part 2/3; = reprint of 88Beng1, chapter 1). History and anthropology, in: Hall, John A./ Bryant, Joseph M. (eds. ): Historical Methods in the Social Sciences, Volume One (Historical Social Science: Presuppositions and Prescriptions), London/UK & Thousand Oaks/Ca./USA etc. 2005: Sage Publications, pp. ? (in part 1: History and the social sciences; = reprint of 90Aeng1). (illegal copy: without quoting HyperGeertz(HTM) & JSTOR as directly used online sources). Blurred genres: the refiguration of social thought, in: McLaughlin, Becky Renee/ Coleman, Robert (eds. ): Everyday theory: a contemporary reader, New York/N.Y./USA 2005: Pearson & Longman, pp. ? (chapter "Education and institutions"; = reprint of 80Aeng2). the original text also as HyperGeertz-Text. Dichte Beschreibung. Bemerkungen zu einer deutenden Theorie von Kultur, in: Texte zur Theorie des Textes, Hrsg. u. komment. v. Stephan Kammer u. Roger Lüdeke, Ditzingen/BRD 2005: Reclam, pp. ? (= reprint of 83Bger1, pp. 7-43). full text: http://www.nybooks.com/articles/article-preview?article_id=18797 (subscribers or charge). (illegal copy: without quoting HyperGeertz(HTM) and MUSE as directly used online source). Little review, in: Common Knowledge (Durham/N.C./USA: Duke University Press), vol. 12, no.3 (fall 2006), pp. 525-526 (= Book review on: Barry Allen, Knowledge and Civilization, with a foreword by Richard Rorty (Boulder, CO: Westview, 2004). Comment on "Michael G. Peletz: Transgenderism and Gender Pluralism in Southeast Asia since Early Modern Times", in: Current Anthropology (ed. : Chicago/Ill./USA: The Wenner Gren foundation for Anthropological research; pub: Chicago/Ill./USA: Univ. of Chicago Press), vol. 47, no. 2 (April 2006), pp. 327-328 (article by Peletz: pp. 309-325). other commentators were: Evelyn Blackwood, Tom Boellstroff, Mark Johnson, Tamara Loos, Martin F. Manalansan, Dédè Oetomo, Megan Sinnott, Eric C. Thompson, with a reply of Peletz to all commentators at the end. full text available via EBSCO-SocIndex (restricted access). In welcher Gesellschaft leben wir eigentlich? Gespräch mit Armin Pongs, in: Pongs, Armin (ed. ): In welcher Gesellschaft leben wir eigentlich? (Gesellschaft X. Band 3: Perspektiven, Diagnosen, Konzepte), München/BRD 2006: Dilemma-Verlag, pp. ? (forthcoming, not published yet, announced since Nov. 2002, now due for April 2007 !). Interview recorded probably already Nov. 2001 in Berlin on occasion of 01Ieng4 (?). Nagara. Państwo-teatr na Bali w XIX wieku. Kraków/POL 2006: Wydawnictwo Uniwersytetu Jagiellońskiego (298 p., = translation of 80Beng1; trad./ tłum. z jęz. angl. : Wolska Dorota). A leghrosszab hír az …. in: Anthropolis Online (Antropológiai Közhasznú Egyesület, Budapest/HUN: Anthropolis Egyesület), vol. 3 no.1 (III. évfolyam 1. szám, 2006), (ford./ translation Henger Krisztina és Ungár Nóra) (= translation (in part) of 00Beng1 ("Available light, introducton")). Kulturbegriff und Menschenbild, in: Winterling, Aloys (ed. ): Historische Anthropologie (Kap. : "Grundfragen der Anthropologie"), Stuttgart/BRD 2006: Steiner (Basistexte 1: Geschichte), pp. 47-66 (= reprint of 92Tger1 = translation of 66Aeng2 "The impact of the concept of culture on the concept of man"). 'Deep Play': Ritual als kulturelle Performance, in: Belliger, Andréa (ed. ): Ritualtheorien. Ein einführendes Handbuch, Wiesbaden 2006: Verlag für Sozialwissenschaften (3. Auflage), pp. 97-123 (= reprint from 83Bger1 = translation of 72Aeng1). translation into German: Brigitte Luchesi. ‘From the native's point of view’: on the nature of anthropological understanding, in: Williams, Malcolm Edward (ed. ): Philosophical Foundations of Social Research Methods, Volume Two (Philosophical Issues in Research Strategies), London/UK & Thousand Oaks/Ca./USA etc. 2006: Sage Publications, pp. ? (in part 3: Interpretation, language and meaning; = reprint of 74Aeng2). De Bali al posmodernismo: una entrevista con Clifford Geertz (Entrevista realizada por Silvia Hirsch y Pablo Wright, editada originalmente en la revista Publicar Nº1), in: Antropologicas. Una mitrada atenta entre tanta bulla (online since 02/11/06 = reprint of 93Ispa1). republished on occasion of CGs death. original text also as HyperGeertz-Text & HyperGeertz-Abstract (English). (illegal copy: without quoting HyperGeertz(HTM) and UAM as directly used online sources). "To Exist Is to Have Confidence in One's Being": Rituals as model systems, in: Creager, Angela N.H./ Lunbeck, Elizabeth/ Wise, M. Norton (eds. ): Science without laws: model systems, cases, exemplary narratives, Durham/N.C./USA 2007: Duke University Press, 2007, pp. ?. first print of the lecture at: Princeton workshop in the history of science, Princeton University, Princeton/N.J./USA: Dept. for the History of Science, Saturday, December 11, 1999 (Workshop II: Human Sciences; audio recording available at the department); see 99Ieng1. see the table of content of the collective volume: Redesigning the fruit fly : the molecularization of Drosophila / Marcel Weber -- Wormy logic : model organisms as case-based reasoning / Rachel A. Ankeny -- Model organisms as powerful tools for biomedical research / E. Jane Albert Hubbard -- The troop trope : baboon behavior as a model system in the postwar period / Susan Sperling -- From scaling to simulation : changing meanings and ambitions of models in geology / Naomi Oreskes -- Models and simulations in climate change : historical, epistemological, anthropological, and political aspects / Amy Dahan Dalmedico -- The curious case of the prisoner's dilemma : model situation? : exemplary narrative? / Mary S. Morgan -- The psychoanalytic case : voyeurism, ethics, and epistemology in Robert Stoller's Sexual excitement / John Forrester -- "To exist is to have confidence in one's way of being" : rituals as model systems / Clifford Geertz -- Democratic Athens as an experimental system : history and the project of political theory / Josiah Ober -- Latitude, slaves, and the Bible : an experiment in microhistory / Carlo Ginzburg -- Afterword : reflections on exemplary narratives, cases, and model organisms / Mary S. Morgan. Little Review, in: Common Knowledge (Durham/N.C./USA: Duke University Press), vol. 13, no. 1 (winter 2007), pp. 143-144 (= Book review on: Nanda, Meera, Prophets Facing Backwards: Postmodern Critiques of Science and Hindu Nationalism in India (New Brunswick/ NJ 2003: Rutgers University Press)). see also: http://muse.jhu.edu/journals/common_knowledge/v013/13.1geertz.html (restricted access). Les sciences sociales et la religion: la nécessité d'une nouvelle approche, in: Cahiers français. (Paris/FRA: La Documentation française), no. 340 (Septembre-Octobre 2007), pp. 3ff (= translation of ??). Yerel Bilgi. Istanbul & Ankara/TUR 2007: Dost Kitabevi editors (254 pp., = translation of 00Beng1 "Avialable light"; translation/ Çeviren: Kudret Emiroğlu). Здравый смысл как культурная система, in: Опубликовано в журнале: «Неприкосновенный запас» 2007, № 4 (54 )Здравый смысл и обыденный язык); = translation of 75Aeng1 "Common sense as a cultural system" (in the revised version of 83Beng1, pp. 73-93; translation/ Перевод с английского Андрея Захарова/ Andrea Zacharowa). Как мы сегодня думаем: к этнографии современной мысли, in: ЭТНОГРАФИЧЕСКОЕ ОБОЗРЕНИЕ • № 2-2007, pp 3-16 (= translation of 74Aeng2 "From the native's point of view: on the nature of anthropological understanding", translaters/ пер. с англ. А.Л.Елфимова/ A.L. Elfimowa). The social history of an Indonesian town. Westport/Ct./USA 2007: Greenwood Press (= reprint of 75Reng2 = reprint of 65Beng1). Thick description: toward an interpretive theory of culture, in: Monaghan, Leila/ Goodman, Jane E. (eds. ): A cultural approach to interpersonal communication: essential readings, Malden/ Ma./USA etc. 2007: Blackwell Pub., pp. ? (= reprint of 73Aeng1). original text also as HyperGeertz-Text. Person, time and conduct in Bali, in: Wulff, Helena (ed. ): The emotions: a cultural reader, Oxford/UK & New York/N.Y./USA: Berg, pp. ? (= reprint (shortened) of 66Beng1 = chapter 14 in 73Beng1). (illegal copies: without quoting HyperGeertz(HTM) or Questia as directly used online sources). Welt in Stücken: Kultur und Politik am Ende des 20. Jahrhunderts. IWM (Institut für die Wissenschaft vom Menschen), Vorlesungen zur modernen Philosophie. Wien/AUT 1996: Passagen Verlag (2nd, revised edition, 120 p.; = German versions of 95Ieng1; trad./ aus dem Englischen von Herwig Engelmann; red. by Peter Engelmann). "Technologien und Marktmechanismen unterwerfen heute die Vielfalt der Kulturen einheitlichen Standards und lassen sie zu einer globalen Zivilisation zusammenwachsen. Mit dieser Globalisierung geht eine zunehmende Fragmentierung einher, die spätestens seit 1989 auch auf Europa übergesprungen ist. Das Ende der Blöcke hat zentrifugale Kräfte und Wanderungsströme freigesetzt, denen der klassische Rahmen des Nationalstaates immer weniger standzuhalten vermag; gleichzeitig scheint die europäische Integration ins Stocken zu geraten. Sind wir im Begriff, uns dem kulturellen Patchwork und den fraktalen Gesellschaften Asiens oder Afrikas anzuverwandeln? Droht das Programm des westlichen Liberalismus mit seinem Anspruch auf Universalität und Konsens zu scheitern?" (http://www.passagen.at/titel_info.php?id=745&preview=). Anthropologie: entre savoir et morale, in: Wieviorka, Michel (ed. ): Les Sciences sociales en mutation, Paris/FRA 2007: Éditions Sciences Humaines, pp. ? (section "Concepts, disciplines et carrefours" = translation of ??). 地方知識: 詮釋人類學論文集: Di fang zhi shi: quan shi ren lei xue lun wen ji ("Local knowledge", 3rd Chinese edition). Taipeh/TWN 2007: 麥田/ Mai tian chu ban she (324 p., ISBN 986173225X = translation of 83Beng1; revised reprint of 00Tchn1; trad. : 楊 德睿/ Derui Wang). = second, revised Taiwanese edition of 02Rchn1 (?). Religion as a Cultural System (Chinese excerpt), online only: http://dchen.forevernew.com.tw/wordpress/?m=200706; further link: http://dchen.forevernew.com.tw/wordpress/?p=5#more-5. (Interview  with Neni Panourgia), in: Marcus, George E./ Panourgia, Neni (eds. ): Ethnographica Moralia: Experiments in Interpretive Anthropology, Fordham University Press, pp. ? (reprint of 00Ieng3 and 02Ieng1). Comment nous pensons maintenant: vers une ethnographie de la pensée moderne, in (online only: Société Oboulo 2007-08: Paris/FRA): http://www.oboulo.com/clifford-geertz-pensons-maintenant-ethnographie-pensee-moderne-in-savoir-local-42280.html. (Nicolas Rouillot; secondary comments including several citations from the respective chapters in: 86Tfre1). = translation of 82Aeng1 ("The way we think now"). = reprint of the French translation, in 86Tfre1. = partial translation of 79Aeng1. = online reprint of 03Tfre1. = several commentaries (by Clifford Geertz as editor included, and pertaining to explanatary contexts & problems, as developed already.